Tonight's the night when things go bump and the witches fly! Most of us will close our shops and head home to greet the spooky goblins and ghouls at the door for Trick or Treat. But there are some, mostly witches and warlocks, who will be open for Halloween business if you care to visit them. This image is from The Paper Shelter and I've had it since last year but had never used it. I thought it would be perfect for a post on Halloween itself. It's colored with ProMarkers and cut with a QuicKutz circle die. I printed the sentiment before I cut the circle. I used three different papers all layered onto one another, plus some luscious mesh ribbon that is oh, so sparkly and gives some great texture! I added a sheer ribbon bow with a pearl. All of those seemed to really work with the vintage image. 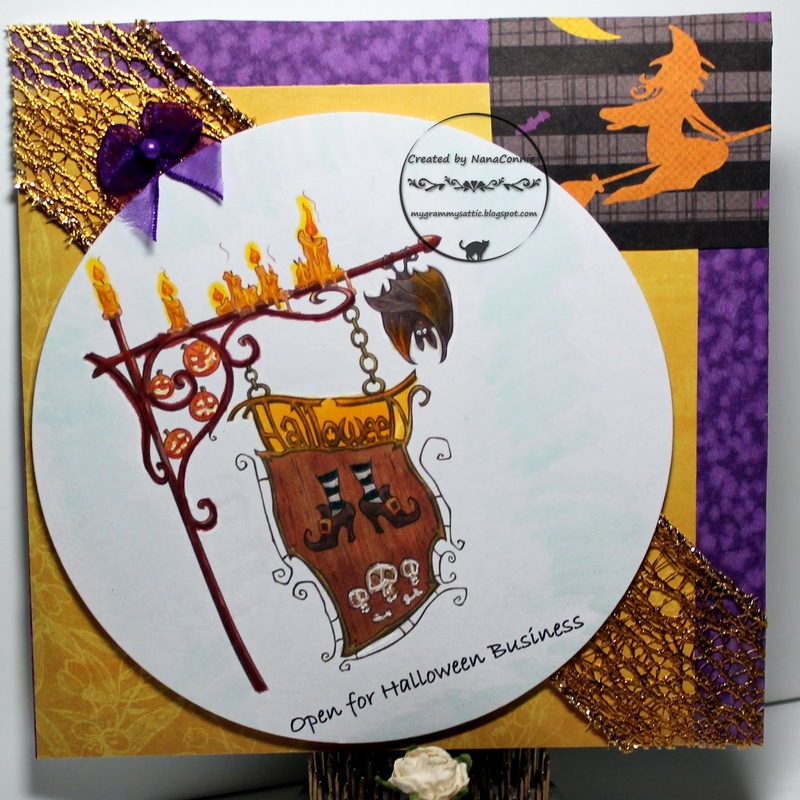 Brilliant Halloween card Connie, love the image and the witch on her broomstick. So fun and cute!!! Love all the spookiness! Squeal - LOVE it, super papers too. Oh I love that sign! I wouldn't mind having a real sign like that for my front lawn! You colored it perfectly! Thanks for joining us at DL.ART Challenges! A wonderful card and lovely to see one of our images too! October 29 is National Cat Day!